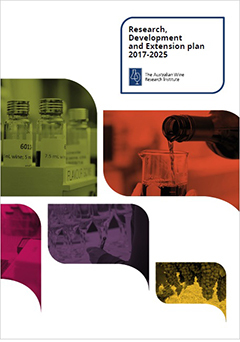 The AWRI’s Research, Development and Extension plan for 2017-2025 is the blueprint for the AWRI’s activities up to 2018. It replaces and builds on the achievements of the AWRI’s 2013-2018 RDE plan. The plan details 5 major themes and 21 subthemes. Projects under each subtheme will be developed and refined through Annual Operating Plans. The RDE plan was developed through a wide-ranging industry consultation process. The plan provides a starting point and a clear direction; over time it will evolve in line with emerging opportunities, changes to industry priorities and needs, and available funding. It formally commenced on 1 July 2017. Industry feedback on the plan throughout its life is welcomed and actively sought. The themes and subthemes within the plan align with broad priorities identified in Wine Australia’s Strategic Plan and other relevant industry and Government strategic directions. For further information about the AWRI’s RD&E Plan, please contact Ella Robinson, Communication Manager.